My little dog, Bria was coughing and I took her in the Vet on Monday. He diagnosed her with Congential Heart Failure. He put her on a medicine that would help pull the fluid that was building up in her lungs. The next day she got progressively worse. Then suddenly she got better. But in the late afternoon she started having seizures and she was having them every 10 minutes. I knew it was time to do the only humane thing even though it absolutely broke my heart. She was euthanized this evening at 6:00 pm. My sweet friend is at peace now. I know she went over the Rainbow Bridge to meet her friends that are already there and they are running and playing in healthy bodies. This gives me peace and hope that maybe one day I will see her again. Oh PJ my heart aches for you! So hard to lose a beloved pet. Love ya lady and will be thinking of you!! 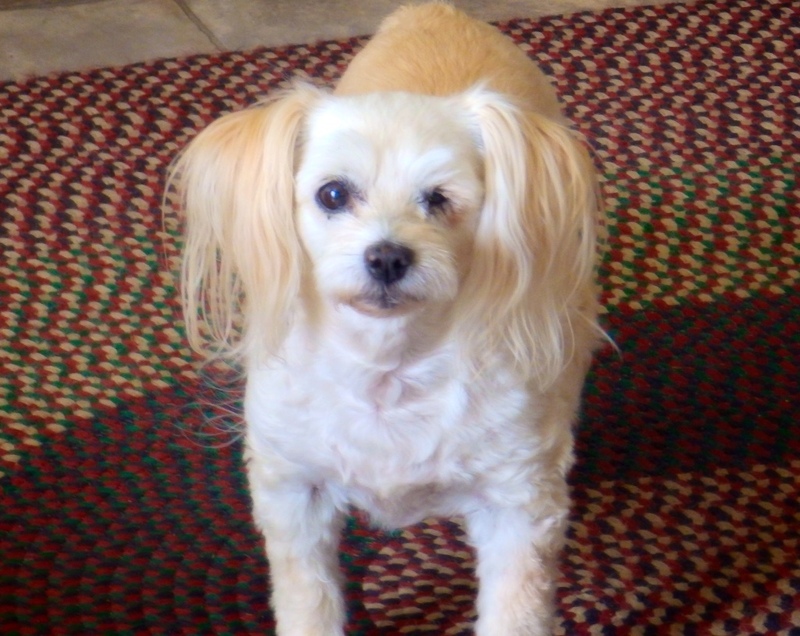 My precious Maggie had congestive heart failure as well and died from it. Yes Rainbow Bridge is a wonderful place! Think of that and give yourself a big ((((Hug)))) from me! Thank you so much JR for your kind and loving words. I agree. She joyously went over the rainbow bridge and is in a new little body that she is running and playing with my other beloved pets that have passed away. That gives me peace. It is so sad to lose a pet, no matter what the circumstances and I’m sorry to hear about your beloved Maggie. Thanks ,it was 3 years ago now ,but yes still miss her. She is not suffering anymore and yes that is a good thing for your precious Bria and my Maggie. the important thing is that neither of them are suffering anymore and they both have healthy new bodies! Thank you so very much. I truly appreciate that. My heart goes out to you, PJ. I have two cats myself. Thank you so very much Margarisa! I truly hope for good health for your cats! I’m sorry for your loss. It’s heartbreaking to lose a dog. She looks gorgeous – and yes I’m sure she’s very happy now again. Thank you so much for your kind words! She was a very very sweet little dog. And I truly believe she is happy and healthy now! Thank you so much Terri and thank you for recommending that book. I also believe that God loves all the creatures and has a special place for them in heaven. I also believe I will see her again – as well as the other dogs I have had that passed away. It gives me peace to see her in a healthy body and running with all of her friends, and Oreo! Thank you so much Mandi for your kind and loving words. It’s hard to let them go but eventually it is inevitable. She didn’t have to do much suffering because I took care of that and let her go in the most loving way I could. Again, thank you sweet friend! Thank you Mandi. I appreciate that. I’m so sorry that you’ve lost a friend – but maybe lost isn’t quite right because maybe you will see her again one day. Our furry companions leave such big paw prints on our hearts. I wish you all the best. Thank you so much for your kind words! I agree with you. We will see them again one day. Meanwhile, they are at peace and are in healthy new bodies where they can run and play like puppies again. Thank you so much Funsie! I really appreciate your kind words. Yes, our pets become members of our family and it is hard to let them go. But it comes a time we have to make a hard decision as to what is best for them. I too believe that I will see her again. That brings me comfort. Thank you! So very sorry for your loss….it is so hard to lose our furry loves! Thank you so much for your kind words. You are absolutely right. It is hard to let our furry loves go, even if it is best for them. Thank you so much Ritu! I appreciate that. Oh PJ I am so sorry for your loss and that you had to make the difficult decision of putting him to sleep, even though it probably was the right choice for him. I totally understand how heart broken you must be over this. When I left Sri Lanka this time, leaving the dog was the hardest part. Thank you Tania. I really appreciate that. I’m sure leaving the dogs was very hard! Especially if you get close to them. It was hard and I was surprised as to how easily I got attached to him and he to me. Thank you so much again Jodi! She was a sweet little dog and I’m going to miss her but under the circumstances, I made the right decision. Thank you for the sweet words and the warm hugs. You did. You made the unselfish decision of love for her!! Thank you Jodi. It was the best decision for her. It was terrible what she was going through. Thank you Barb. I appreciate your kind words. Under the circumstances, I made the best decision for her, as hard as it was. So sorry for the loss of your furry friend. Thank you so much Roger. I appreciate that. she’s a sweetie and in a better place now, my Dusty he’s running and playing with her too, she will be ok, he’s a good watchdog and friend. Sorry for your loss, I feel your pain and just want to say be strong ok! Thank you Gina! I know she is at peace and running and playing with your sweet Dusty. I am so sorry PJ! It is very hard when one loses an adorable pet…but as you said, she is at peace now…! Take care! I’m sorry to hear about your loss. It’s always hard to say goodbye to a loved pet. Yes, it sure is hard to say goodbye. She had been with me for over 15 years. Thank you for your kind words! I’m sorry for your loss. A week ago or so, my niece’s family lost their beloved pit bull “Sparta” to something very similar. She was a very sweet dog. Thank you James. I appreciate your kind words. I am sorry for your niece’s family. It is hard to lose a beloved pet. Thank you Jade! I had her for over 15 years. She was a much loved little dog. Thank you so much Colleen. I appreciate that. How are you doing today Priceless? Thank you so much for asking Colleen. I miss her terribly. She has been my loyal companion for 15+ years. She was such a sweet little dog. I knew the end was inevitable but it still hurts when it comes. Fifteen years? That is amazing. I’m glad she was such a gift to you, I wonder what she would say about you? 🙂 I’m glad you had her. Yes, she was with me over 15 years. I think she would say very nice things about me. She loved me dearly and I was very good to her. Thank you Colleen. I will. Oh! I didn’t realize that you wanted me to make her a flash fiction prompt. I don’t think I could do that. (Ignore my flubbing Priceless.) 🙂 I just hope you write about her in your blog about what she would be saying to you. Because I do think she would want you to know how she felt. I think it would make a wonderful story and maybe help you with the pain of her loss. Thank you so much Colleen, that would be a good idea. I probably will do that in my journal. I hesitated to click the ‘Like’ button. I clicked it because you expressed your feelings so well. they do. Sadly, I agree, Bria, may have been in more pain and discomfort then we can feel. I pray you heal from this. She is playing with her other friends who’ve crossed the rainbow bridge as she has. She will be waiting for you to arrive to enjoy your hugs once again. Thank you Isadora for your kind and loving words. Yes, she had to be in a lot of pain with those horrible seizures. She left this world very peacefully. I certainly will miss her but I will see her again one day. I feel so much with you! I used to be on the other side, the side that had to decide to do it. It was always heart-breaking. You can’t get used to it. My wishes are with you! Thank you so much Cecilia. I really appreciate your kind words. I really miss her and am struggling with questioning if I made the right decision. I’m sorry to hear that. May she rest in peace. Thank you so much Yinglan for the kind words. Yes, may she rest in peace. Thank you so much Cat! It’s so good to hear from you again! Yes, I do remember how hard it was for you to lose your beloved cats. It was so hard to let her go Cat. I feel so very sad. I know it will take time to get over it. She was my sweet loyal companion. It takes a lot of time, Joy, its been three years since my two passed and I’m still a little wobbly whenever I think of them. The important thing is to allow yourself time to be sad. Bria had a wonderful life with you, Joy, and she will leave an empty space forever… it does get easier in time. Thank you Cat. I hope it gets easier. Yes, there will always be an empty space that she use to fill. So so sorry Joy. Never a more loyal friend. Thank you so much Tim. It has been tough not having her here. I miss her terribly. Thank you. I”m sure you do because I know you and Mary love your dogs. Thanks for your kind words. Thank you so much Dina for your kind words. I sure miss her. I’m so sorry to hear this. Hugs. What a beautiful picture of her. And it’s obvious from your words that she was loved. Thank you so much Chrissie, I appreciate your kind words. There is a big hole in my heart right now. Thank you so much Rosey! I miss her so much! 😦 😦 😦 huuuuugs your way dear. Thank you so much Lynn. I really miss her. Thank you Lynn for understanding. She was with me for over 15 years. Wow that is a long time! Yes, it is a long time but then, not long enough. So sorry to hear this news, Joy. Not really anything I can say. Hard to loose a 4-legged member of the family. Thank you Tena. I appreciate your kind words. I really miss her. I had her over 15 years and she was a loyal and sweet companion. Thanks Deb! Yes, I will see her again and I look forward to it! I just saw your post. I am so sorry about Bria. Thank you so much Tildy. I sure miss her!